Are you serving ham for dinner? Whether you're planning a Thanksgiving, Christmas, or Easter holiday feast—or you just enjoy one for dinner every now and then—the best part of eating ham is the tasty side dishes that bring out its sweet-savory flavor. From classic casseroles and roasted vegetables to pastas and rice, these delectable sides will be a hit each and every time. 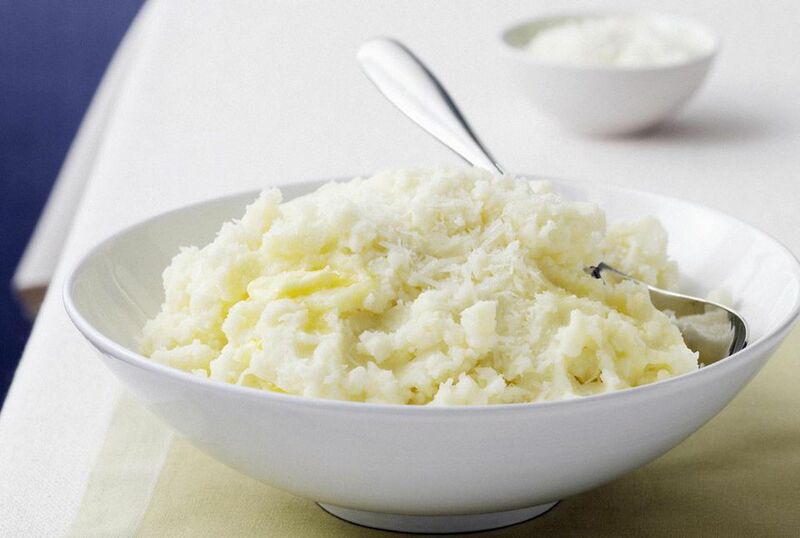 These simple mashed potatoes deliver loads of flavor. They are made with plenty of garlic, milk, and butter, but you can also use half-and-half cream for a richer mash. Either way, they make a great side for your ham dinner! Baking rice with vegetables and cheese is a genius way to make the kitchen staple a little more exciting. Fresh spinach, herbs, and Parmesan add color and fabulous flavor to a hearty dish that's sure to be a hit with your family. Potatoes are a classic accompaniment to a ham dinner. With thinly-sliced spuds layered on top of one another, scalloped potatoes certainly look fancy, but using a mandoline makes prepping them a breeze. The casserole cooks in about an hour, combining red potatoes, a quick homemade sauce, and onions with dried mustard and a dash of nutmeg for extra flavor. Fennel is a winter vegetable that develops a wonderfully sweet taste when cooked. Here, it's braised with browned garlic and punched up with Parmesan cheese and bit of red chile to create a fantastic sauce for this simple pasta. Gratins quickly spring to mind when preparing a ham dinner. This easy, cheesy recipe uses cauliflower instead of the usual potatoes, but it's just as creamy and comforting, featuring a heavenly bechamel sauce punched up by a bit of fresh thyme. Roasting asparagus is one of our favorite ways to prepare this popular spring vegetable. All you need is some sea salt and lemon zest for flavoring, but a garlicky aioli or pesto sauce will easily elevate this for Easter dinner. What would holiday dinners be without ham and a sweet potato casserole? 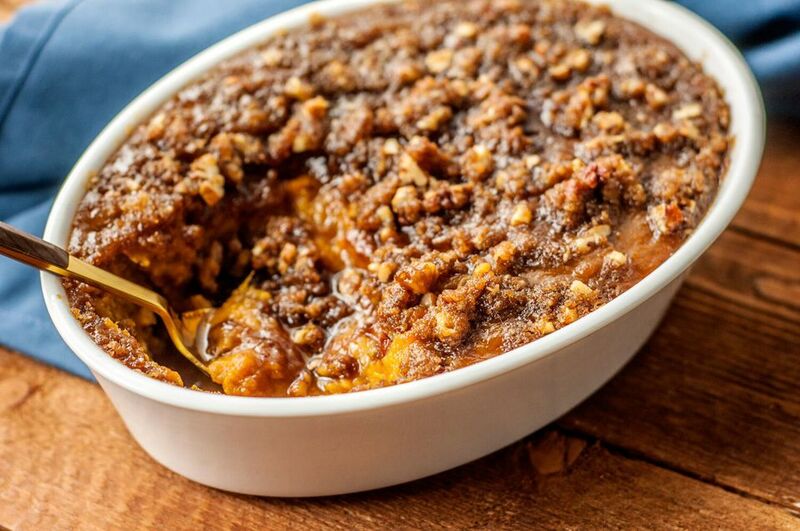 This classic casserole dish recipe is the ideal combination of a creamy sweet potato filling with a crunchy, buttery pecan topping. It's sure to be popular with party guests. Spaghetti squash has a sweet flavor that tastes delicious as an accompaniment to ham. This fall vegetable separates into strands when roasted, giving it a unique noodle-like presentation. A little butter and salt is all you need for seasoning. With its earthy and nutty flavors, a wild rice and mushroom pilaf is wonderful for enjoying in cooler weather. Almonds and spices enhance the naturally meaty flavor of the mushrooms. For best results, rinse your rice under cold running water (use a fine mesh strainer) before cooking. Creamed spinach is a traditional holiday dish that pairs exceptionally well with cooked ham. It only calls for a handful of ingredients—including pureed greens, butter, cream, and Parmesan—but fans of the steakhouse side know it as luxuriously creamy, smooth, and flavorful. Boston baked beans are a popular for ham dinners and they are surprisingly easy to make at home—just soak dried beans overnight before cooking them with bacon, onion, molasses, brown sugar, and spices. Roasting cauliflower in the oven brings out the nutty flavors in this healthy seasonal vegetable. The florets are combined with a savory mixture of garlic and Parmesan cheese, tossed with olive oil, and roasted to perfection. This classic green bean casserole—with condensed cream of mushroom soup and fried French onion topping—is an essential Thanksgiving side dish. Serve it alongside your ham dinner and get ready for rave reviews from your family. Honey glazed carrots and ham go together like peanut butter and jelly. Kids and adults alike will adore this preparation, which coats crunchy baby carrots with a sweet, cinnamony sauce. The super easy and nutritious recipe packs plenty of vitamins, too. You'll be surprised at the fantastic crunch that broccoli develops when it's roasted in a hot oven. This recipe adds ginger and garlic (optional, but recommended) to bump up the flavor of the healthy vegetables even further.